Once upon a time, Grasse – a sleepy, Mediterranean town on the French Riviera – was renowned for its tanneries: workshops where Italian hides were transformed into luxuriant leathers to be worn by the crème de la crème of European nobility. However, there was one unavoidable step in the curing of animal skins – the use of odorous nitrogenous waste – and Italian noblewoman Catherine de’ Medici demanded a more alluring fragrance be applied to her leather opera gloves. When Grassois native Jean de Galimard – the man responsible for providing perfumes and pomades to the court of Louis XIV – offered her a pair soaked in rosewater, she was sold, and the subsequent trend for scenting one’s leather goods swept throughout the courts of Europe. The streets of the city ran awash with the rose and orange-scented waters used to produce such items and, ever since, Grasse has unequivocally been known as the world’s fragrance capital. It makes sense, then, that this is where Louis Vuitton, a brand renowned for its dedication to both luxury leatherwork and storied heritage, has made a home for its new foray into fragrance. Not since 1946 has the house ventured into this domain – and, even then, its offering was distinctly thematic, revolving around its renown as trunk makers. There were the travel-sized bottles of Je Tu Il in 1928 and, in 1946, Eau de Voyage – but, besides their Art Deco bottles and topical names, the scents are shrouded in mystery: not only has their juice simply evaporated over the years, but their original formulae fell victim to an archival fire in the Seventies. Thus, within a series of historic buildings whose interiors have been transformed into idyllic stone-floored sitting rooms and pristine, state-of-the-art laboratories, Jacques Cavallier-Belletrud, maître-parfumeur of the maison, has found “a blank page” upon which he can create. Cavallier-Belletrud now spends his days experimenting with fragrance notes and techniques within an estate known as Les Fontaines Parfumées, which sits atop La Foux, the spring that forms the life force of Grasse (it has been used both for the tanneries, and for the irrigation of flower fields). In the early 20th century, locals and tourists alike would journey to these buildings to refill their perfume bottles from the fountains of scented water that would stream from the taps – a tradition that owner Louis Vuitton is now reintroducing. Cavallier-Belletrud’s office is located only a few hundred metres away from the local school where he spent his formative years, just down the road from the expansive fields of flowers he would visit as a child. Standing among the gardens of the domain – now planted with thousands of jasmine bushes and Calabrian bergamot trees – he is not only at the very centre of the perfume universe but, perhaps more pertinently, he is home. Among the series of seven scents that the house has newly released is Turbulences: an earthy, resinous floral rooted in one specific memory – sniffing the midnight air as he stood with his father between two fields, one of blooming jasmine and the other of tuberose. “I wish I could put this moment in a bottle,” Cavallier-Belletrud remembers saying – and now he has: they are suspended within elegant glass flaçons created by designer Marc Newson. He spent years creating these fragrances – four, to be precise – but without surveying focus groups, or acquiescing to budgetary restraints. In fact, the only method he seems to trust when it comes to testing fragrances is trying them on his wife, Claire, his “living blotter” who has worn only his creations since they married 29 years ago, he says proudly. 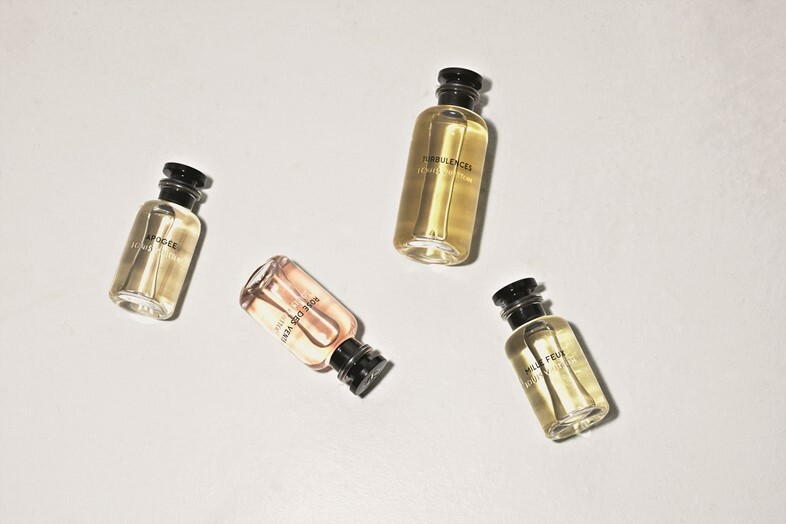 As he talks through the scents – the leathery, gentle musk of Dans la Peau; the velvet fruitiness of Rose de Vents; the climactic tribute to lily of the valley that comprises Apogée – his wife and one of his teenage daughters appear. “They’ve never seen the presentation!” he explains, and you get the sense that it’s truly a family affair. It’s all a bit like a fairy-tale, made only more remarkable by the fact that the longhaired man he remembers working beside his father in the 1970s now inhabits the office next to his own: François Demachy, the head perfumer at Christian Dior. It is rare to find two perfumers working in such close proximity for companies who are, while part of the same luxury goods group, to all intents and purposes rivals – but here, at Les Fontaines Parfumées, it works. Forty years after spending his childhood just a short stroll away, fantasising about a career of his own, Cavallier-Belletrud has been given the freedom – not to mention the funding – to build his own legacy, one determinedly rooted in Grasse, but which extends far beyond. “I never dreamed of this; it’s more than I could ever have imagined,” he says. And when you sit in his office, complete with a portrait of Louis Vuitton and a custom-designed trunk to hold his perfumery paraphernalia, you wholeheartedly believe him.